Season 2 of OINB dropped into the Netflix queue on Friday, and apparently plenty of people had time to go through all 13 episodes. I’m not a binge watcher and I think it’s unfortunate that binge watching has become a thing for our time shifted TV watching. Frankly, I just don’t see who has the time to actually sit down for that many hours on a weekend to watch an entire television season. Are there that many people with that much free time? Or are unemployed hipsters the new must reach TV demographic? So I’ve only seen three episodes so far, but I think it’s enough to know that I’m going to enjoy the season. When last we left Piper she was beating the crap out of Pennsatucky in the yard, a season long culmination of evolution from prissy upper class WASP to what she she’s been all season and just hasn’t acknowledged; just another inmate. Piper, with no knowledge of Pennsatucky’s condition, is roused from solitary confinement and flown via con-air to Chicago, all the while with no idea why she’s been sent there or when if ever, she’s coming back to Litchfield. Back at Litchfield, things proceed without Piper, with interesting flashbacks on Taystee and Crazy Eyes to see what began their journey that would end up in prison. And Red confronts a new/old rival who intends to take control of the prison. One of the things I like about the show is that none of the inmates are who we think they are, including Piper. Our impressions undergo a convergence. It’s not that Piper becomes like her fellow inmates, it’s that she already had a part of her that was like them, and it slowly becomes uncovered. And the other inmates? They were always more complicated then we gave them credit for. Any time there is a show with a diverse cast there will be some sort of racial controversy, however in general, the reviews are fairly positive in that regard too. The Root has a second season review called, Today’s Best Black Show has a White Star. NPR’s review is New Faces Keep ‘Orange is the New Black’ Humming in a New Season. This review is written by Eric Deggans, a man whose racial sensitivity meter is always turned up to 11, also gives a positive review of the show. In a previous incarnation as writer TV & Media critic for the Tampa Bay Times, Deggans managed to almost single handedly get a syndicated radio show kicked out of the Tampa radio market because it crossed his racial line. So are we supposed to think there is a racial agreement on the merits of the show? There is the show, and then there’s the image of the show. One of the many blogs I frequent had, not a review of the show, but a review of billboard advertising of the show. 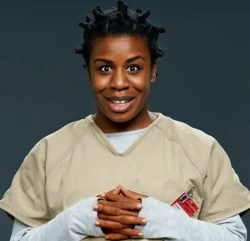 Particularly Suzanne “Crazy Eyes” Warren (Uzo Aduba). The gist being, based on the billboard advertising, Orange is the New Black is a minstrel show that debases and degrades the image of black women. As Spike Lee might say, it’s “coonery and buffoonery.” I waded into the discussion with the argument, based on watching the entire first season, that the idea that show degrades black women is a severe misreading of the show. The intent of the show is exactly the opposite of that; however my knowledge of having watched the entire first season couldn’t counter impressions of the show made by a few images. Normally I enjoy a good internet argument, but quickly saw that this one was already doomed based on the way the commenter’s were taking this show personally, felt that feelings supersede actually viewing and knowledge of the show, and was told to stop by the blog owner. That’s fine, and although I feel I’m correct that the show does the opposite of what those commenters said, the fact is it probably would not have occurred to me to view those images as offensive in any case. I’m not even attuned to my image and representation being constantly shown in a degraded light by the media; just the opposite. Of course I have many identities and some of them I am sensitive to their portrayal. As a dad, I’m well aware that dads have been treated as clueless idiots in TV and movies since the early 1980’s. It’s the rare TV dad that shows the common sense, wisdom, or maturity of Ward Cleaver or Mike Brady. I’m also sensitive to the portrayal of military veterans; again because I am one. Frequently they are shown as damaged goods, crazy, homeless, suicidal. That’s not the typical story of military veterans in general, but it’s common enough on TV and movies. Of course the argument could be made (and it has been) that the show really hates men. All the good men are weak and useless; all of the strong ones are jerks. As a man however, I didn’t really care. I think those portrayals made sense in the context of the show. Just because a show shows dumb dads, crazed vets, or evil men doesn’t mean I won’t watch the show. And that’s the difference, I think. Since my image isn’t generally attacked in media, I don’t view media impressions as a personal attack on me. Clearly the image of white men in the media is positive. For every Django Unchained or 12 Years a Slave, there are literally hundreds of other movies in which white guys are the heroes. Even if these white guys get arrested for a crime-they-didn’t-commit, they can be assured of facing a black female judge in court. This entry was posted in Pop Culture, Race, TV & Movie Reviews and tagged Binge Watching, Crazy Eyes, Eric Deggans, Laverne Cox, Monsters In The Morning, Netflix, Orange is the New Black, Pennsatucky, race, Reviews, Uzo Aduba. Bookmark the permalink. I’m a binge watcher. I will watch the OINB in probably two sittings. I’m finishing up “Longmire” tonight with my sister. I enjoyed the OINB season one and will enjoy season two (you should have posted a spoiler alert). I think the program shows the plight of women in general whether in prison or not. The majority of woes comes from being poor and female, not race. When you have nothing, you are the same. OK there is another category of binge watcher; the retiree. A time when you can finally catch up on TV! That’s hilarious! I’m glad that unemployed hipster-shaming had a beneficial effect on your daughter. I only wish it had the same effect on my daughter. I’ve gotten through about half the episodes. Like you I felt the season opened strong (episode 2 was a bit weak), but as the episodes progressed I found myself getting mind numbingly bored. The show has its moments but the plots and dialogue are repetitive and eventually drag out painfully, the racial themes try to be edgy but fall flat (none of the black actresses sound or even act authentic… I’ve spent my fair share of time around genuine ghetto rats). I assume you’ve seen Vee by this point, who is clearly meant to be The Strong Black Woman, and I was intrigued by her at first but then lost interest in that thread too. I’ll probably turn back to the show in desperation later this summer. As far as binge watchers… don’t forget housewives! Not that there are many of us left. I’ve been good though and only watched about 1 1/2 episodes a day. Don’t forget there’s a vet in OITNB, even though he’s depicted as weak, at least they didn’t make him a crazed gun hoarder, and he appears to have sincere intentions toward his pregnant GF. I’ve seen just the first 5 episodes of the season, so yes I know who Vee is and I had hoped she was gunning to be the new Red, but it sounds like that doesn’t come off. Don’t tell me any more! No spoilers! I’ll wait and see for myself. The vet isn’t a gun hoarder, but he’s been severely injured so he’s “damaged.” And of course weak. So weak that he’s putting his child at risk. And the others, Pornstache, he’s evil, Caputo: weak. Healy: weak and vindictive, and of course Larry: Super weak. However it doesn’t bother me that all the male characters are terrible people in one way or another. I get the writer is a feminist, hear me roar and all that. I think the characters work. It doesn’t seem to me that the poor portrayal of men hurts the show. Don’t worry, nothing I said is spoilerific and I haven’t watched past episode 8. The men are the best part of the show and are probably made weak and pathetic in an attempt at humor. One thing I noticed, if the show is an accurate representation there are an awful lot of lesbians in prison (not the bi-curious ones, but women who were lesbians on the outside). Does this mean lesbians are disproportionately more likely to commit crimes? It did seem the number of “real” lesbians, as opposed to what Vee might call “gay for the stay” was a lot higher than I would have expected. I did’t know if that was emphasized for the show or not.. I tried Googling that but that only lead down a path of perdition that did not actually answer my question. Well I do appreciate your thoughtful research into lesbians for me lol.